Combine orange juice, lemon juice, 1 1/2 tablespoons oil, 1/4 teaspoon salt, and pepper, stirring well with a whisk. Combine shrimp, remaining 1 1/2 teaspoons oil, and remaining 1/4 teaspoon salt; toss to coat. Thread 4 shrimp onto each of 6 (12-inch) skewers. Place skewers on a grill rack coated with cooking spray; grill 3 minutes on each side or until done. Remove shrimp from skewers; keep warm. 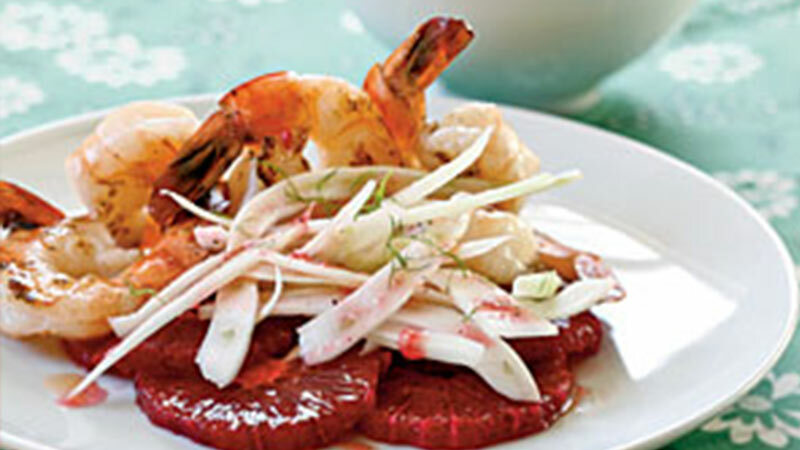 Divide orange slices evenly among 4 plates; top each serving with 1/2 cup fennel and 6 shrimp. Drizzle 1 tablespoon dressing over each serving. Sprinkle with fennel fronds, if desired. Serve immediately.